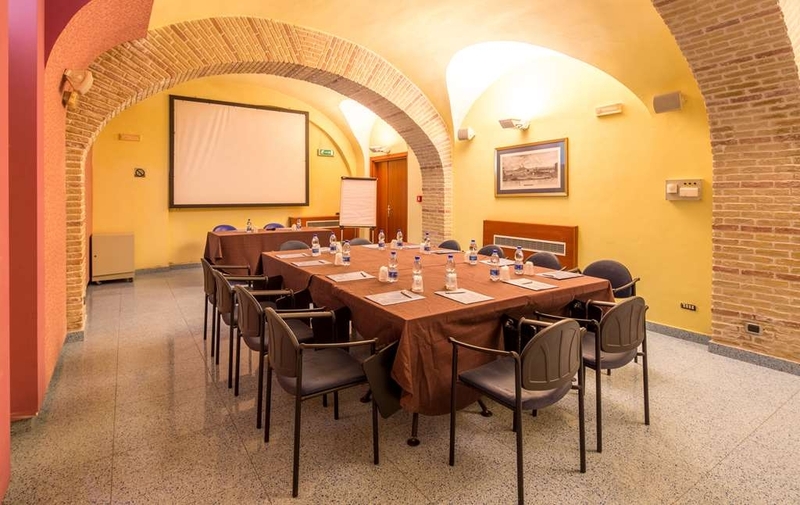 The Best Western Hotel Plaza is ideally located in the center of Naples. Come and experience our hotel near the major tourist attractions. Best price guaranteed and exclusive deals. The Best Western Hotel Plaza is an historical building of the 19th century, recently renovated. We are located near the inner city and the airport, train station and bus terminal. Our restaurant offers local cuisine and the meeting rooms accommodate up to 150 guests. Enjoy your stay. The location is very closed to the central train station. The hotel inside is nice and clean. The staff in the hotel is very nice, but outside of the hotel make us feel unsafe. So many people hanging out on the street and some of them came up and asked for money. The streets are not clean at all. We didn't go out at night for safety concern. We stayed at the Best Western as it is located near to the station. It is also in walking distance of some really good restaurants and an easy walk to the centre. The WiFi is good and the rooms are basic but have everything you need. They are quite small and the beds are hard but not too small. The breakfast was really good and met our needs and it's nice going to the top of the hotel to the roof terrace. If you want a bar culture this is not the place to stay it's much better suited for those who want to get out and about. The local square is quite busy with people of less advantage but nobody bothered us at all. The rooms are kept clean and refreshed. I believe this was good value for money and would return if I ever wanted to revisit Naples. "Unsafe location to bring your family"
Our first clue was a repeated warning from the taxi driver to not walk around at night as the area was frequented by prostitutes and "bandidos". Then enroute to hotel near train station -police action, a draped body on the road and news crews. Best Westerns are usually in good locations but this one scared us enough not to leave our room at night. The proximity to the train station is the selling point but be very careful. The hotel itself was clean and decent but it won't be a place we will return to.. The hotel is centrally located, close to the station. The area around the hotel is a bit seedy but convenient if one plans to take the train to Pompeii, Sorrento, etc. It's also a 20 minute walk from the Duomo and other places of interest e.g.museums & cathedrals, etc. The rooms are small and there were a few things not functioning - the kettle was malfunctioning, the shower door woukdnt shut, etc. The receptionist on the first day was an unhelpful, indifferent sort whereas on subsequent days there were others who were more helpful. All in all we found it ok.
"Average hotel very close to the station and easy walking to the town"
Nice room with comfortable bed and small balcony overlooking the Piazza. Average bathroom with small shower. Excellent breakfast in roof-top restaurant. Let down by the rather abrupt and unfriendly staff. Area around the hotel wasn't well looked after, with lots of rubbish on the pavements and piazza. "In the heart of today's Naples"
You can't beat the location, it's a short walk from the central train station. The hotel is located in a neighborhood where immigrants from Africa and Asia are starting off in Italy. So in between more traditional pizzerias and cafés there are also Indian restaurants and ethnic supermarkets. It's today's Italy. The people at the hotel are friendly and efficient. I was in town on a blustery winter day and the room was warm. Rooms are small but were tidy and comfortable. Plenty to see and do in the neighborhood. Try a coffee and breakfast pizza across the street from the hotel at Café Brazil. 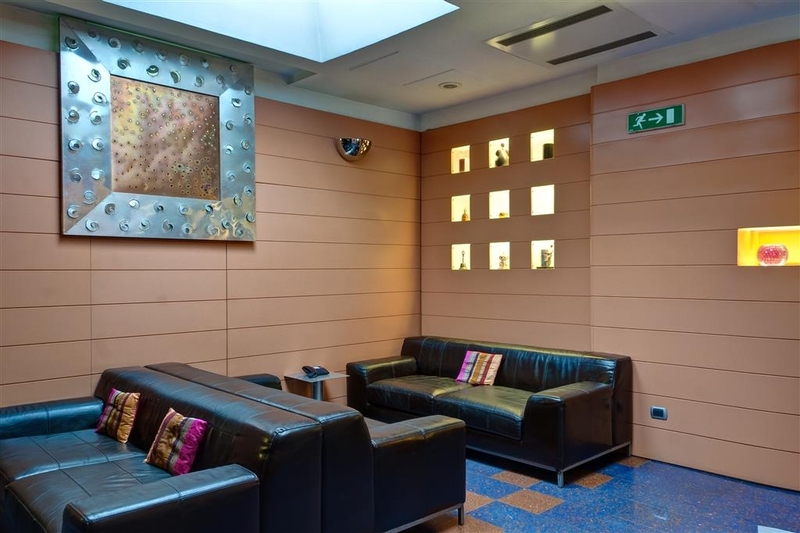 "Fabulous hotel for this area overlooking a piazza, near Napoli Centrale Station." 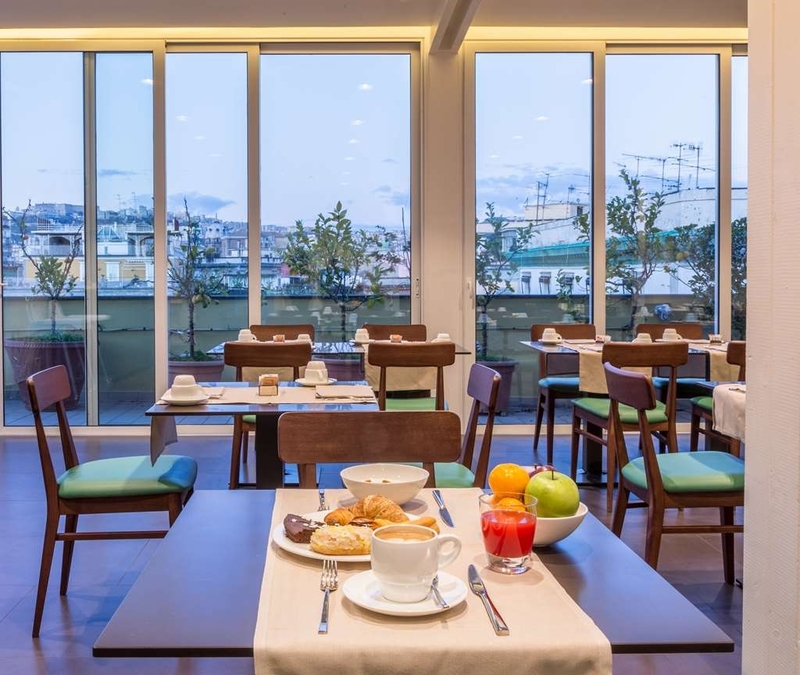 A fabulous hotel overlooking a piazza, a short walk away from Napoli Centrale Rail Station and several clothes shops and pizzerias. The area around Napoli Centrale is an absolute melting pot of crowds,so keep your valuables close to hand, well hidden away. I have stayed in this surrounding area before, but at this particular hotel, as a lone female traveller I have felt the safest, so far in this area, even venturing out to the Da Gaetano Pizzeria, recommended by Gian Franco. The receptionist Gian Franco was lovely and very helpful and allocated me a lovely room on the first floor. The bedroom was very clean, the bed very comfortable and the shower room spacious with lots of fluffy white towels and toiletries plus hairdryer and a safe in the bedroom. Best surprise of all, was a kettle with Twinings teas, coffee, milk and sugar in the comfortable modern bedroom. Great signal from the free WiFi and there is a mini bar in the bedroom should you choose to use it. TV as standard. I cannot comment on the breakfast as I had to check out at 5am in the morning. It was great value and a relaxing stay before my morning flight and I would stay here again. OK for three nights. Friendly staff, good breakfast, room temperature nice (in January). The room was clean and quiet but very small. Wifi OK. The worst experience were the nearby streets, as a middle-aged woman travelling alone I was afraid to go out in the evenings. i should say Price Was very good for the quality, but very bad and unsafe location.you can pay a little more and get way better location, it was close to center but it was near central station which was full of drug dealers and i hate to say crazy people. "Good value for money city centre hotel"
The Plaza is in an excellent location only a short walk from the railway and bus stations. There are an abundance of shops close by and a few excellent gelitaria (ice cream shops). The hotel offer comfortable accommodation at an affordable price. The staff are very welcoming and helpful. Some of the surrounding streets did look a bit suspect as is often the case around stations but we found no problems in the city. Taxi trip from airport was less than we expected. Staff was very pleasant, recommended restaurant within walking distance that was amazing. Room was clean and comfy if a little tight, shower was REALLY small (my 6'4" spouse did not fit at all), but everything was in working order, so hard to complain. Breakfast was included and very good also. Lift was a bit slow - minor inconvenience. "Great hotel in the heart of Naples"
The reviews for this hotel on here are very mixed and some very strong bad ones. We weren't sure what to expect, we had booked another hotel but there was a problem So we booked this one a few weeks before our holiday. The hotel is lovely, the room was exactly what we needed, great bathroom and aircon. The view wasn't great but this didn't bother us. The staff were accomadating and pleasant, they are very invested in their lodgers and their needs. The breakfast is vast and is served for a long time which was great for lay in days. 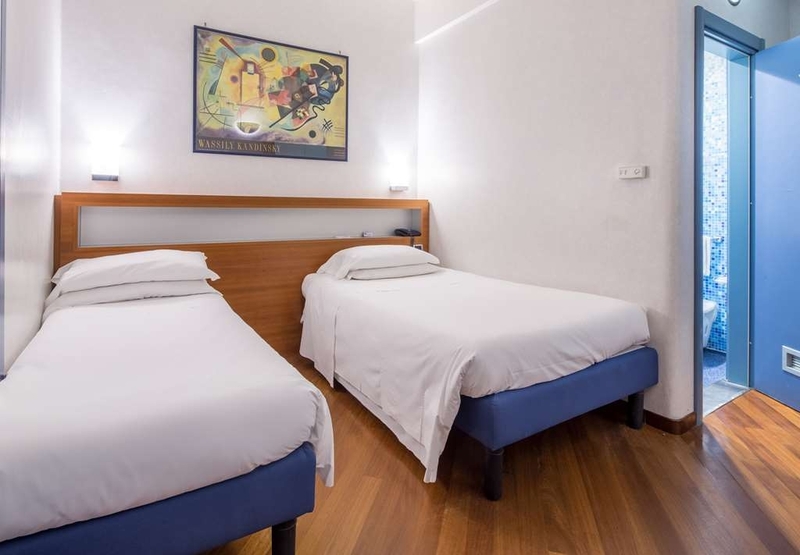 The location is great for tourists travelling outside naples, short walking distance to Station Garibaldi which will take you to Sorrento, Pompeii etc. The area is a bit rough, but reminded me of some areas of London. The night life is quite busy but there are a lot of officials around and I felt quite safe in the late evening. There weren't many tourist staying here, mainly business people but this didn't affect our stay. It meant the surrounding rooms were quite and we hardly bumped into many other people. They were helpful and friendly, I would recommend this hotel for anyone staying in Naples. A lot of reviews here have marked it down due to the location, honestly the hotel is worth 4 stars and it's not the hotels problem for the area. It is a little uncomfortable, a lot of people on the streets but I felt safe and we didn't see or run into any problems. "An adequate hotel in downtown Napoli"
I've stayed at this hotel several times, and we've had good experiences each time. We like the convenience of being close to the central train station, and at the same time close enough to most downtown sites to walk. The hotel staff is helpful, pleasant and accommodating. The rooms are adequate, WIFI works well, breakfast is typical. We've never had an incident, considering where the hotel is located, although we are well aware of the stories that accompany being near the train station in Naples. We travel during the day and stay close to the hotel at night - always practicing due diligence with our valuables. "Excellent in a vivid Naples area"
Location in a typical busy Naples area: railwaystation, market and restaurants very close. Excellent breakfast buffet. For an early departure they arrange a taxi and a early coffee with biscuits. Very kind service at 4 AM. 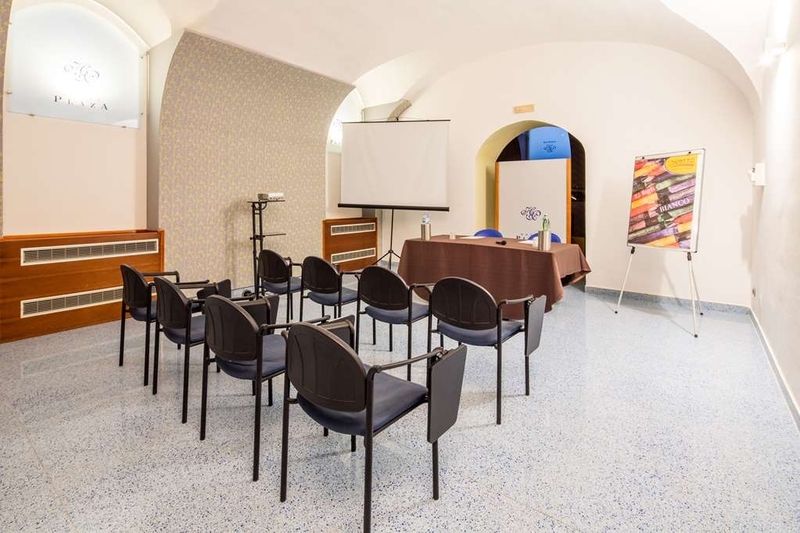 "You must visit castel Sant Elmo in the vomero district the views over the city and the bay of Naples are breathtaking"
This hotel is very clean, staff friendly gave good information about things in the area. The room was ok but a very small shower. The area its in is Very run down lots of graffiti and rubbish. Police outside the park 24hrs a day. Sad for staff and local people in the area. Me, my brother, father, cousin and two uncles one of which is in a wheelchair booked this lodging well in advance. We where sure to book a handicap accessible room and bath. They messed up the booking and gave us a non handicap accessible bathroom and were unwilling to fix their mistake without extra payment. No where near a 4 star hotel in any aspect, not even 2! Would not recommended it to anybody that's not from a third world country. We feel really hustled in so many ways! Look elsewhere!!! Stayed for 10 days in this hotel at the beginning of August. Location isn't very inviting - a microcosm of the city itself, which struggles to keep itself clean. reception area - upon arrival, the interior appears dark and dated, with dark wooden panelling. Check-in was fine, with helpful staff on reception. We were let into our room that was on the 3rd floor with a view out over the piazza, by a cleaner - as we had difficulty opening the door). once inside, we quickly discovered an issue with the safe - we could not fit a standard 10inch tablet in it,; also, we could not open the safe with the key. after a bit of to and fro , it emerged that there was another key for the safe ( which we had not been provided with). This did indeed work, but unfortunately, so did my car keys, house key...in fact anything that could cause the entire barrel to turn!! We were told that this would be rectified the following day/ or we could move rooms ( this after having unpacked!). Suffice to say neither of these events occurred for the duration of our stay ,meaning that I had to carry a large sum of money around with me for the entire holiday. The room door proved a challenge for the entire holiday, requiring the equivalent of a masonic handshake in order to open it. The room offered a kettle for tea and coffee - but only plastic cups more suited to cold water. The saving grace of this hotel was the breakfast area on the top floor - this was bright and airy, in contrast to the rest of the hotel. The breakfast choices were broad enough, and the serving staff very pleasant. I direct my ire at the Best Western chain itself, which is clearly starving this hotel of funds needed to maintain and improve the standards they aspire to. The personnel on the ground are doing their best in difficult conditions. I have stayed in several Best Western hotels in my time, the brand giving an expectation of a certain level...this was far and away the worst experience I've had. Very sketchy area my hire car was almost stolen damage meant it couldn't be driven and the hire company Sicily by car would not replace or give me a refund because I parked it outside the hotel so stuck in Naples and public transport which actually wasn't too bad public transport that is the hotel staff were very good and Joseph was brilliant re the car. Inside hotel was ok as long as you didn't look out of the window there was constant police sirens and people were lurking about all day and night really felt unsafe and I am a karate 2nd Dan. Never will I ever stay in Naples again at a hotel that says it has air conditioning in July, that clearly doesn't. The general manager told us that the whole hotel was set on 18 degrees and that our thermostat was decoration. But that wasn't 18 degrees! My boyfriend and I couldn't sleep next to each other, no covers with the windows wide open to get a cross breeze. We had no air circulation. My cosmetics melted from the 33 degee room temperature. And we were told that there was nothing that could be done. The rest of the hotel was a hot box as well. The 5th floor, that serves breakfast oddly was the coolest spot in the hotel but not cool by anyone's standards. We counted the minutes until we could leave our one night stay! 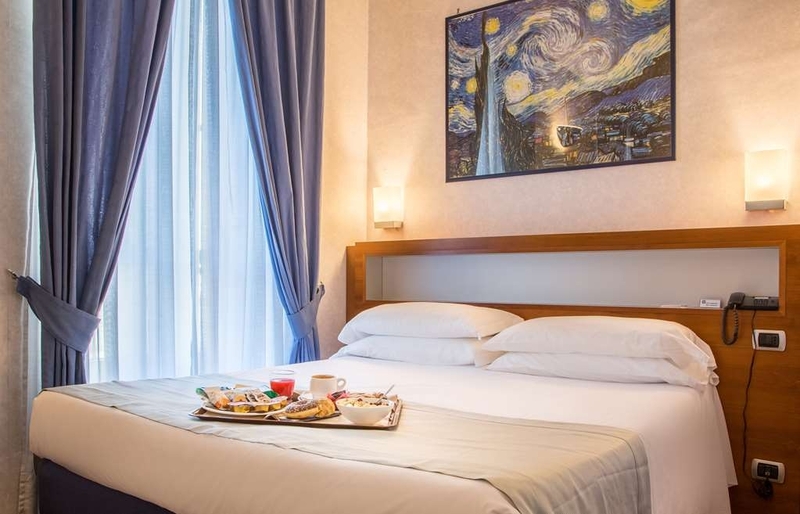 I don't know how hotel ratings are handed out in Italy, but 4 is probably a big dream away. I can give some credit to its proximity to the main train depot and also to the rooftop breakfast buffet. This is also a spot for smokers to puff away with a nice city view. But the rooms are small and variable. My shower was at best suitable for a beanstalk. The air conditioning works, but is capped. Though the plaza and surrounding streets look dangerous, they really aren't. And there's a flea market selling lots of sneaker shoes that pops up on the plaza every evening (so you can buy your extra walking shoes here and not have to pack them). You might have some difficulty finding this place without GPS. Though Tribunali and Toledo, the big tourist streets, are fairly close by, the streets weave a little, so GPS will also help here. Unfortunately, after spending a wonderful 2 weeks traveling in France and Italy we spent our last night at this hotel to be close to the Naples airport since we were coming from Sorrento. Not our choice, booked via travel agent. It was about a 10 min ride to the airport and we were charged €35. The hotel AC barely worked. It wouldn't go any cooler than 80 degrees Fahrenheit. The shower was so small a person could barley fit. The hairdryer cut itself off after about 2 minutes and then you would have to wait for it to cool itself down before starting back up. It is in about the worst part of Naples I have ever seen. The worst streets in New York City looked cleaner and felt safer. There was no place to eat in the hotel and we walked around for about 30 minutes without seeing ANYTHING suitable food wise, so just went back to the room and tried to sleep in the sweltering heat. Our travel agent will be sure to hear about this and I wouldn't recommend flying out of Naples unless necessary. Even at that point stay further away, maybe Pompeii would have had nicer hotels and take a train to fly back out of Rome. Great restaurants nearby ( especially Mimi's) , wonderful rooftop terrace. 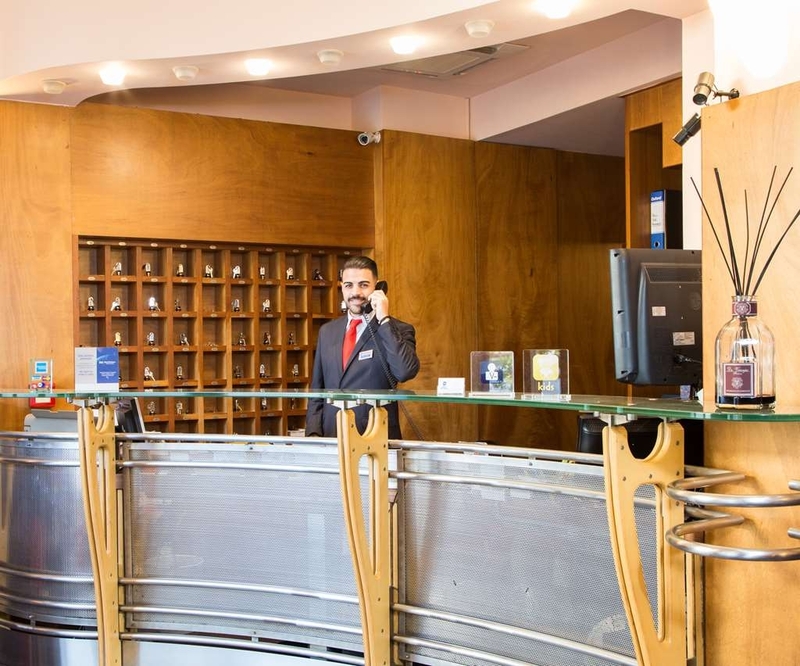 Best of all were the staff- a special shout-out for Giuseppe on reception who couldn't have been more helpful and made our stay a memorable one. Can't wait to come back! Very happy with our stay here! A comfortable place but best of all were the staff. So helpful, they really go out of their way for customers. Giuseppe from reception was extremely good to us, I lost my phone and he called ALL the taxi companies in Naples to find it. A great start to our holiday- we'll be back here! The hotel itself was okay, just like any hotel. The neighbourhood was a very crappy one, though, and if I had known that I would've chose another location to stay. Nothing to complain about the hotel itself. Very good HOTEL, the only mistake is the coffee facilities in room with plastic cup but after spoken with lady at reception she change with porcelain cup, very smart. Location very good as well in the middle of P.zza Principe Umberto. The hotel was fine but in my opinion not 4* . The room we were allocated was very dusty, customer service from the front desk was extremely poor. The only highlight was breakfast which I couldn't fault. The breakfast team were the only staff I found very helpful. For a 4* hotel they don't provide slippers to wear in the rooms so you had to either wear your socks or shoes. "Hotel is nice. Service is not so nice." Location and hotel itself is adequate but was overshadowed by the horrid customer service I received. My booking, checking in and checking out experiences were all very poor. I was shocked at my treatment right from the very first moment. I do not recommend this place at the present time. They need to review their staff first. "personnel very helpful and friendly"
We stayed 2 nights , there was no airconditioning, the control fell off the wall when we tried to adjust the temperature. The room size was not as advertised, it is in a really bad neighborhood although really close to the train station. We stayed for 3 nights and i agree with all that stilettostatutes wrote. The area is dangerous and dirty both day and night. I didnt mind the hotel decor but the air con didnt work and my husband was bit by lots of mosquitoes. I asked at reception for 2 cups for our room. I was told to go back to my room but they never arrived. There was no mention of a restaurant as stated on the website and there were bikes there which looked like they were for guests but no mention of them either. Our room only had 1 curtain instead of 2 which was eventually replaced. This ruined our trip to what is a beautiful city in the historic centre. Please do your research before booking to ensure your trip is a good one. "Hotel and area from hell"
"Worst hotel experience EVER! STAY AWAY! INFESTED!" Understandably, the room was nothing special or exceptional but I was not expecting anything exceptional for $100 USD a night. However, the website states that it is a four star hotel – it is so far from a one star hotel, it is shocking. The room looked like a hospital room with horrible neon lighting. It also was in a horrible location - basically in the slums of Naples - so many homeless people, drug dealers and prostitutes all over the area... but that isn't the worst part. The entire hotel is INFESTED with mosquitoes. So much so, that they are in the elevators, the hallways, the lobby and the rooms. After checking in later in the evening and heading to dinner before settling in for the night, we only had a few hours to sleep before getting an early morning flight out of Naples. When we retired to our room, we started getting ready for bed. That is when we discovered the extent of the mosquito problem – they were all over the walls, the ceilings, the curtains. I counted over 3 dozen mosquitoes in our room that evening, and several more in the bathroom. When I called down to the front desk to ask to be moved to a different room, I was told that the hotel is fully booked (which I found hard to believe) and was told that “even if there was another room available, there are mosquitos all over the hotel”. She said she would send up some mosquito spray for us shortly – which never happened despite two further calls. We were up all night swatting at mosquitos buzzing around our head and trying to stay under the blankets in a room where the a/c was barely functioning (and impossible to adjust). I eventually got up a couple hours later to find dead mosquitos around my head from the hours of swatting in the dark, along with at least 14 bites on my arms, face, shoulders and even my eyelid! This is beyond a simple inconvenience and is a health concern. Absolutely unacceptable for this hotel to be open and operating AND charging people money. Both my partner and myself were unable to sleep that night and both suffered extensive mosquito bites. When we finally left the hotel, we asked reception to call us a cab to the airport. The cab driver picked us up, meter running and then charged us double on our credit card without even telling us... so much for the hotel ensuring a reputable cab company for its customers. This hotel made a good impression, it is as it is billed: comfortable and well maintained without being stunning. The room itself was cosy and contained all the usual amenities, meanwhile breakfast was also very tasty and had good variety. The only drawbacks are that coffee at breakfast is from a machine, although this helps to get in and out faster in a hurry; and that the hotel is quite a way from the more 'happening' end of town. That said, it is perfect for the train station! Would return. I had a thoroughly enjoyable stay 5 night at this friendly, comfortable hotel where the staff did their upmost to help me. Salvatore and Olympia were exceptional as were the breakfast staff who remembered my requests and preferences. As a single female business traveller I always felt safe. The bed and pillows was extremely comfortable and the rooms are well insulated from the outside noises and are very clean. It is a busy neighbourhood with a very cosmopolitan feel and this is what one expects in a city. I recommend this hotel highly. The location is not bad, it was not too far away from the station. The problem was a number of unemployed young guys sitting on every corner next to the hotel. You feel not safe and this was not Italy any more. The streets were filled with rubbish and a lot of beggars and sellers of useless stuff. One night we heard shots fired near by late at night. When we asked the reception next morning we were told - don't worry it wasn't in the hotel. Also room had strong smell from A/C system and I guess the A/C filters were not replaced for a long time. "Very bad neighborhood - not safe "
We booked this hotel very last minute, while on a road trip through italy and should have done my home work better by reading reviews. This hotel is in such a bad area. Not safe. There are passed out people on the street, bums sleeping, garbage everywhere and large groups of immigrants approaching you. I had prepaid the hotel and was shocked when i arrived. We asked the hotel manager for options to rebook us in other best western as we didnt feel safe but there was nothing he could do. "Its like this in every big city " and yes we have an immigrant problem". We left without a refund and went on to book a hotel somewhere else. I can only recommend people; do NOT book this hotel. There are far better options in napels. Clean and clinical. Rough area - a lot of young men just sitting around on the square opposite the hotel. Don't think I would venture out in the area at night. The bed was extremely hard. There were no cups for tea, nor were any brought when we asked for them. Reasonable rates and would only stay there in an emergency. Close to the station so it would have benefit if you had s late arrival or early departure. "We didn't feel safe there..."
This hotel in a small plaza is just round the corner from the main station and the metro. Easy to walk to main attractions of Naples. Really clean place staff very friendly and knowledgable, also includes "free" breakfast . Only sting in the tail...room tax €3.50 per night per person. First time in Naples and booked here. At first was worried, but turned out to be a great option! On a square close to food and clothing markets and a mini market next store. Rooms are clean with everything you could need for a vacation. Close to the train station and it is a vibrant area but I never really felt unsafe. Staff friendly and breakfast more than adequate. I would go back again. Hotel so close to so much to do and so close to transportation options. We were able to see pompei and vesavius all on public transportation for much less than a tour bus. Was a great option and will be back to do some shopping! 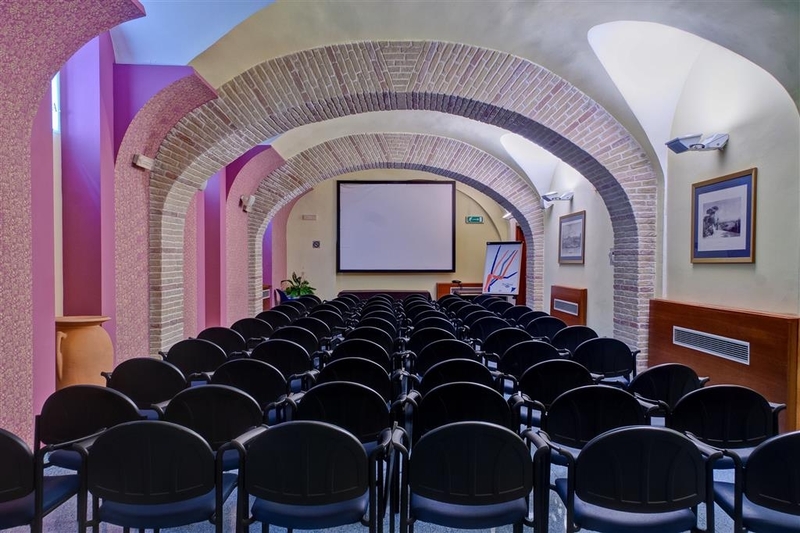 "Nice location for a Company's workshop"
I have booked this Hotel trusting Best Western brand name and despite location is not properly the most attractive in Naples. It's quite close to the old town, that is an advantage for tourists or job travelers than need a quick escape to relax from hard working. However it's close to the Souk of the Central Station that may prove be challenging as far as safety at and beyond sunset. The above is mitigated by a very attentive and professional crew that add a touch of Neapolitan kindness and spontaneous care for clients. Ms. Olimpia is especially a benchmark of pleasantness and shine well beyond what professionalism dictates. My workshop has been fully successful and my guests (colleagues from all over the world) were extremely pleased about my couple of days dedicated to our job session. Extremely recommended. "Great breakfast and Convenient Location"
Olympia (at Reception) was friendly and extremely helpful with great tour and restaurant suggestions. Hotel drivers provided short city tour and airport drop-off on final day. My room was a good size, comfortable and spotless. Breakfasts were scrumptious! 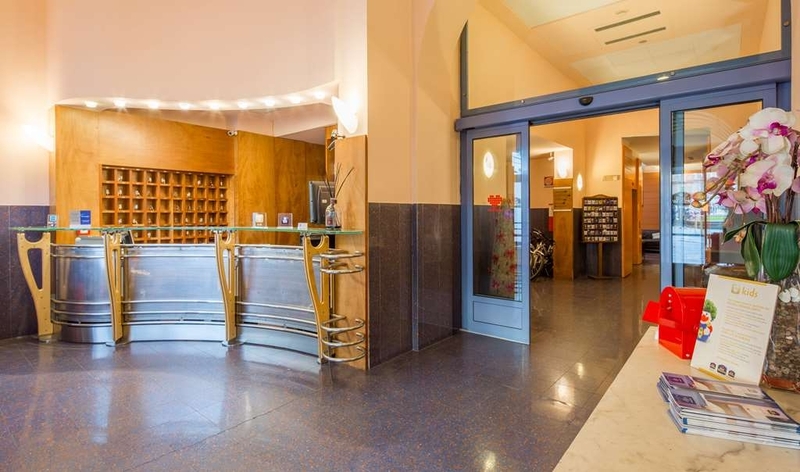 Convenient to Central Station, Garibaldi Piazza, Hop on-hop off Stop 10 and good restaurants. Hotel area not beautiful, but I walked everywhere, even at night & did not feel threatened. Located very nicely. Good breakfast. Rooms aren't great. Shower cubicle is very small. You can get hurt. Bathroom bad. Not friendly staff. But again if you want to be near main train station then this is it. "Ideal for the train station"
I had no issues with the hotel although as mentioned in other reviews the area directly around the hotel does seem a little daunting, without feeling threatening though. My room was of a good size and clean but did look out over the plaza which made it a little noisy. Breakfast is on the top floor with a nice patio and the available items were good without be excessive. The train station is a few minutes walk away where you can catch a ride to the several major tourist attractions in the area. Overall I would stay here again. P.S. Do not stay here if traveling by car! "VERY DISAPPOINTED! Cancelled our booking a day before we arrived "
A day before our arrival to the hotel, we receive an email from the hotel saying it's over booked. The booking was made much earlier, confirmed, and paid for with confirmation voucher sent to me. The hotel apologised and put us on a hotel which 3km away from the original location . Disrupted all our itinerary. Such a lousy hotel. Room Booking is basic bread and butter of hotel business, how can they mess up, and it's a day before! "Comfortable rooms but terrible location"
"If you are not street smart, please avoid this hotel as the area is dodge!" 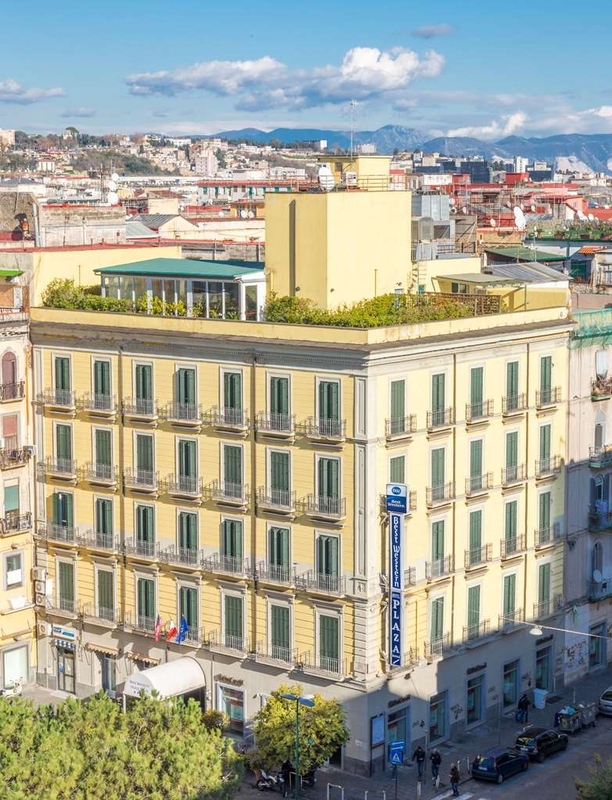 This hotel is great for proximity to the central train station in Naples. We booked it purely for that. As we were only staying the night in Naples and going straight to Capri the next day by boat we decided this was best place for a cheap, easily accessible nights stay BUT do be aware that the area outside the hotel has A LOT of strange characters and when leaving/entering the hotel we were very aware of our belongings and not hanging about that area too long. I wouldn't suggest for all female travellers or elderly couples. The hotel itself is nothing special, rooms a very basis but for the price you pay that's all you need for a quick over-nighter close to the train station and short taxi trip to the harbour. Front desk staff we found very nice. Book this hotel but take in to consider the above warnings, I've never stayed in a hotel before and always having my guard up when leaving the front doors. dangerous people seemed to loiter about the square in front of it. "Not good for a high price"
I used 2 rooms for a Night. Staff around 9 o clock at reception was not at all helpful I don't know It get changes or not. No one was receiving call at reception when I called"not at all for 4 star grade. only Pricing is fine. Not to expect any good thing from the hotel. Stayed just the one night here and it was cheap tbh so cannot complain. Mini bar is not to expensive, room was clean, and staff are nice. Breakie was ok, bit limited though! Quite messy outside with rubbish and what looks like a demolished building of sorts. Prob would not stay again. We recently stayed here during a weekend trip to Napoli. The hotel is centrally located just a short walk away from Central train station. The immediate surrounding area is rather dark at night with lots of people hanging around are night and can be intimidating for some. However we faced no issues with during both day and night time. There is a small supermarket across the street and a short walk away you can still down Corso Umberto Uniform - one of the cities swankyest shopping mile. The metro is just 5 minutes away. The hotel is dated and the public areas limited and rather strange. The rooms are very small and not sound proof - ask for a high level floor to be less exposed to street noise and people shouting around, garbage clearing in the night etc. Breakfast in the roof top restaurant is ok. A taxi to the airport costs 20€ and the hotel charges 5€ on top to order a cab - better walk to central train station. "Hotel that cheats with the customer rooms"
We booked a superior room for my wife and me but the hotel put us in a single room. After several claims, one day after we were put in a superior room (as we checked on the hotel website), but the hotel told us they had assigned us a better room. The staff was not so much friendly, I think it was due to the continuous claims of different guests about different problems. This is a clear sign of a deficient hotel services. The breakfast so normal and not much abundant with little replenishment The hotel area (so near the central station, the only advantage of the hotel) can be a bit intimidating, specially at night. We had no problems but it is not advisable for any traveler I really cannot advise tis hotel. It was a mistake, better another in Naples. Spent a short time in Naples and the hotel was very good! Staff were very friendly and helpful, provided us with lots of useful information therefore was able to 'cram' as much in as possible thanks to recommendations. Room was lovely and spacious and completely soundproof - lots of activity outside due to location! Main rail station about a ten minute walk. Breakfast was excellent, good choice of everything to start the day. Would stay there again and will recommend! "Tutto sommato OTTIMO rapporto qualità prezzo"
Hotel evaluation within the standards of its competitors. A GREAT positive feedback : quality/price ratio. Staff very kind. I suggest this hotel for its strategic position : near the metro and the rail station. The Hotel is handy when you come by train or if you need to get to the airport. There is a bus a few minutes from the Hotel that will take you to the airport in about 15 min. The staff was friendly and helpful and the room clean, but the Hotel is not in a nice area and as the Hotel only do breakfast it is not easy to find a nice Restaurant near by when you want dinner. It was actually quite scary as there was lots of noisy people in the street outside the Hotel. It is also not possibly to get breakfast before 7 o'clock which means you are stuck if you need to catch an early flight and you may well have to pay for it unless you check. "Average hotel in a very questionable area"
The hotel is very close to the train station, has free wifi and OK breakfast buffet. However as other posts is in a very poor area. We walked from the train station to the hotel at 11pm. I felt very unsafe the entire short walk. The plaza out the front of the hotel was littered with rubbish and people hanging around. In the morning the contrast was stark with a market in the square but we were happy to leave. The rooms were small and the ottoman in our room was covered in stains. Very basic hotel in a very poor area. Near Central Station, 10-minute walk to the historical centre. Try to get past the dicey surroundings--we spent eight days there and had no problems with safety or with being accosted by mendicants. Special praise accrues to the manager Giuseppe for his solicitude and professionalism. The hotel is ok. The staff are pleasant and the rooms are good. Location should be good being only 500 mtrs approx from the train station but there is a problem. On the walk to the hotel twice we had to fight off thieves from our luggage. They will, apparently, steal anything and it then in turn ends up for sale from street stalls. Outside the hotel there is a park filled with litter and loitering men giving the place a really seedy image. In honesty I would'nt recommend the hotel due to its location. "Very poor area! Felt unsafe :("
We stayed at this hotel for two nights. I cannot understand the good reviews. I followed this advise and was very disappointed. When we arrived I was totally shocked. Right in front of the hotel there is a daily market. It was extremely dirty with plastic and rubbish everywhere. It seems to be a very very poor area. I didn't feel safe here at all. The reception desk was unusually unfriendly as we checked in. He wasn't helpful at all as we asked for tips and directions. You cannot go out at night here and come back without a taxi. The airport taxi driver already warned us at our drop off. It is really a scary area. It's such a pity. The hotel was noisy till very late and the early morning commotion with the daily market makes sleeping late impossible. The central train station is about 10min walk away. This is a positive. The Viator tours from Naples has a pickup point at the Starhotel Terminus right by the central train station. I asked for prices and it wasn't much more than here but MUCH nicer and right by the main station with all connections on your doorstep and a great shopping centre. If you want to enjoy nice evenings out, please don't stay here. You will be so disappointed. Rather pay a bit more and choose a better area. Bus 151 stops practically across the road. Buy a day ticket for 3.50 and take this bus from start to the end. You'll see a wonderful part of Naples with spectacular views on the entire city as you reach the top of the hillside. Eat there at a nice restaurant. The ticket is valid till 23:00. Bus drives are great, you see much more. 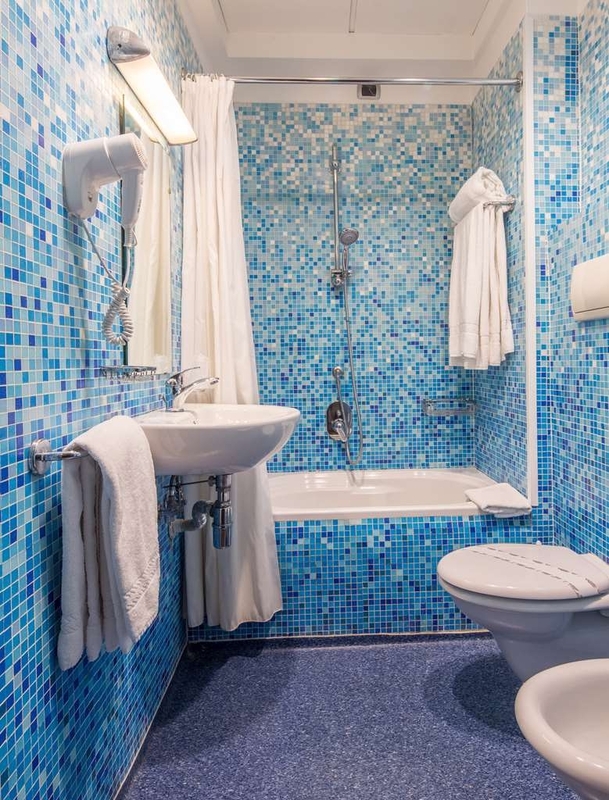 "Nice and clean hotel in the center of Naples"
Perfect hotel in the center of Naples. 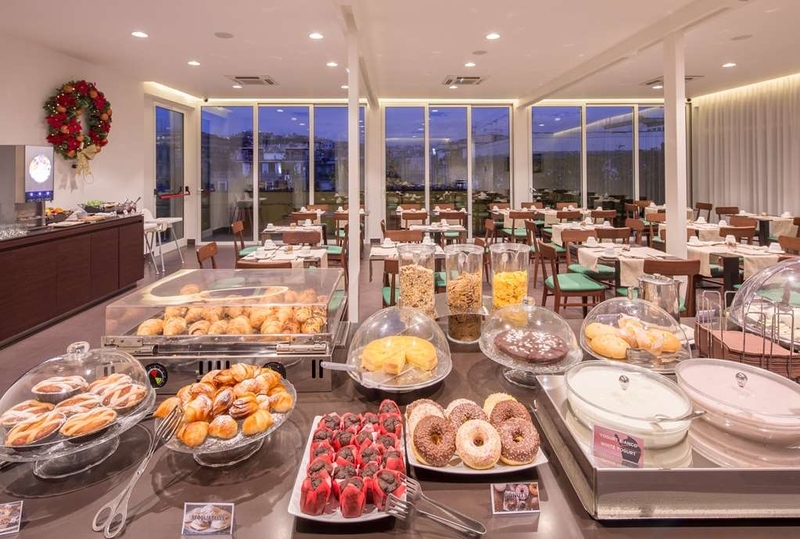 I can recommend the BEST WESTERN Hotel Plaza to all people, who want to be in the center of Naples. The hotel is clean, the breakfast is super. Bathroom is clean and lagre. 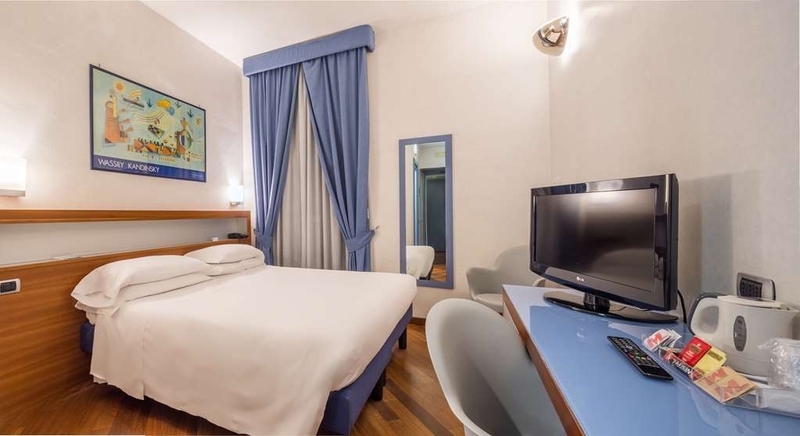 "Excellent choice for quick overnight across square from train station"
This hotel totally satisfactory for our overnight in Naples after touring Capri and Amalfi coast. We had an early morning train back to Rome and wanted clean, comfortable room. Happy coincidence, great little pizza restaurant just around corner (see Trip Advisor, can't recall name at moment). Easy walk to train station with roller bags. "Check hotels near the castle"
The hotel is very close to the train station which was good for us. However, the location, as previous reviews have mentioned, is very dodgy. There are men who hang out in the square in front of the hotel day and night, while they didn't harass us, it was very intimidating. We were on the 4th floor and the wifi was painfully slow in our room. Our room was also quite noisy in the mornings from what we presume is noise from breakfast upstairs. The shower wasn't particularly clean when we got there either, lots of limescale around the outside of it and on the shelf to hold shampoo. The breakfast area looks like a bar and has a door available to an roof top lounge, but this is always closed after breakfast only leaving the reception lounge to relax in. We only payed £40pn for the room and wouldn't want to pay anymore, you can haggle breakfast down to a single Euro which is worth it for that price. Same as others have said: the hotel itself is a decent 3 stars - good breakfast spread, helpful staff, room is OK (booked through Hotwire so ours was small but manageable), but we didn't like the area. It's definitely weird but we didn't have any problems. Hotel in one of the less attractive parts of Naples but is close to Station . room is small and no balcony . Single window looks out onto lines of washing . breakfast is hard breads jam and cereals. No swimming pool and nearest beach is 4-5 kilometres away . Staff were helpful but could not do anything about surrounding which were not very appealing . near eating houses were mostly Kebab outlets but eventually found some italian . Day time Market direct outside hotel which was reasonably cheap. "If I had a choice again, I would not have stayed there"
The mini plaza in front of the hotel was quite lousy at night and made travellers uncomfortable. I dared not go out after 8:00pm. Staff was just fair, a lack of care about guest experience and passion about hospitality. For sure I would not stay at this hotel again as there are a lot more better hotel at lower prices in the town. The hotel did not look like being operated by a so call international brand "Best Western". Very conveniently located to the train station, we were able to walk to the hotel with our luggage and all. Lots of nice restaurants nearby, with great pizzas. The staff was extremely nice and friendly. They had great pastries at the desk. Best coffee place was just across the street. We both enjoyed our stay at the Best Western Plaza Naples. The room was well furnished the tea/ coffee facilities were a bonus. the breakfast choice was ample. with regard to location we were extremely disappointed as to the location of hotel and the filthy conditions just outside, with market stalls every day of the week just feet away from the front entrance. my biggest shock was on our first evening my wife had her gold necklace snatched from her neck. Wow...brought my 4 month old to this establishment thinking it would be decent considering the best western is a reputable hotel chain- I was mistaken. The hotel itself is decent- A/C, modern elevator, clean linens every morning. However, they list an abundance of inhouse services in their guest book. One of them being laundry. Yeah, don't bother. Unless of course you want to pay 106 Euros to have your small load of laundry sent out to A dry cleaner- a serious miscommunication between what they list on their guest services list and what actually happens. Then let's take a look at the location...sketchy to the power of 10. We had to walk about 5 km to get to a part of the city that we didn't feel we were going to be shaken down. Wife's phone was pick pocketed in this area in broad daylight. We had to hightail it back to the hotel before dark if we didn't want to risk our safety. Definitely look for a hotel on via partenope or further west, it's worth the security and peace of mind. Stayed here for the night prior to boarding a flight home after two weeks in Italy. Yes, Naples is a large city with many questionable neighborhoods, but even though the hotel is in a somewhat sketchy area, the staff here was wonderful and helpful. The rooms are small, but they had a great breakfast on their rooftop dining area with a great wait staff that went above and beyond. Good cappuccino fresh made to order, nice pastries that were warm, and even real scrambled eggs, not very common anywhere in Italy for breakfast. Our AC worked fine once the maid showed us how to set it, very counter intuitive , but the room was nice and cool. The surrounding neighborhood was not the best, but there's some pretty good restaurants within a five minute walk to a pretty good part of town. Great driver to take us to the airport, prompt and a nice, clean car, not your usual taxi and the hotel set that up for us as well. Overall, we would definitely use this hotel again in the future for sure! The hotel itself is pleasant. We double booked and didn't get a refund, but realise this is our error. The area, however, was VERY sketchy. While it is close to the train station and old town, the area is incredibly non-Italian, full of sketchy people hanging around day and out. It seemed to be a very black area (not many white people) and as a young woman I felt unsafe walking around in shorts- got some weird looks too. The hotel is average- slightly unfriendly staff, good breakfast buffet for the price but it doesn't get refilled enough. Great hotel, room, breakfast and location. More than happy with what we paid. Staff first rate, would stay again. Railway station a few minutes away, plenty of eating places, shops etc close by. Nice pool area. "Very affordable and close to the train station"
The hotel staff ware nice and very helpful. Very good breakfast. Very close to the train station. Actual physical location and access to the hotel entry is a bit unpleasant - through a very crowded, busy and non-so-clean street market and neighborhood. Very affordable and good value for the money. "Best place to stay in the center Naples"
Well located, the hotel is halfway between the Central station and the old town. 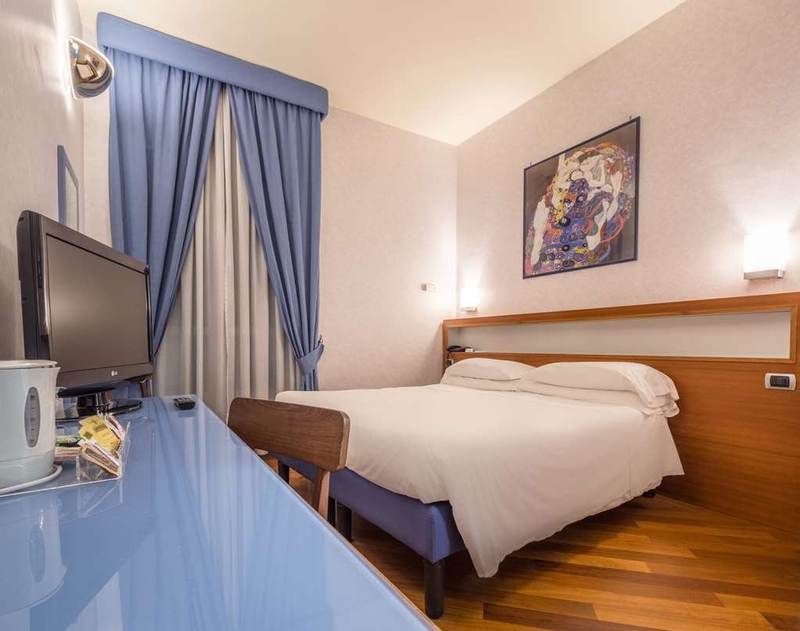 The area is quite messy (that's everywhere in Naples) but you'll feel safe in this hotel. The room is very nice, super clean, excellent bed, a kettle to make tea and coffee, thick curtain and windows, you won't be bothered by the sunlight and the noise from the street. The staff is very nice and helpful. Good wifi too! I keep going back to this hotel, it's this good. "close to metro and railway station"
Pluses : * close to metro & railway station * good breakfast * clean rooms * very good WiFi Minuses : * in front of the hotel is a small market , day is occupied by a flee market , evening and night by a lot of men drinking alcohol ,making noise,beating drums ( tam tam ),dancing * I was warned everyone to guard our pockets and backpacks when we walk through the area.........good advice ! "Nice effort to run a hotel in an very unattractive area of Naples; rip-off taxi"
The best thing about this hotel is the excellent breakfast buffet served on the top floor. The rooms were OK, elevators ok, but slow, staff mostly pleasant. Not Best Western's fault, but the hotel is in a grungy area of Naples (are there areas of Naples that are not grungy?) The small square in front of the hotel is the site of a busy public market. When the market folds it becomes a flea market and when that folds up groups of men loiter about into the night. I did not feel inclined to go out at night. Taxi's. The man at the front desk spoke well of the taxi's they called upon for their customers. The taxi called to take me to the airport immediately tried to overcharge me. The agreed price was 20 Euros, but underway he wanted 35, then 30, then he wanted the price of a coffee. I stuck to 20 Euros. Best Western should vet the taxis they call more thoroughly. "A nice hotel in the middle of the wonderful chaos of Napoli"
I just completed a four week stay at this hotel. It is well located. It is close to the main train station so it is easy to get in and out of the city whether it is upon arrival or for day trips on the Circumvesuviana. 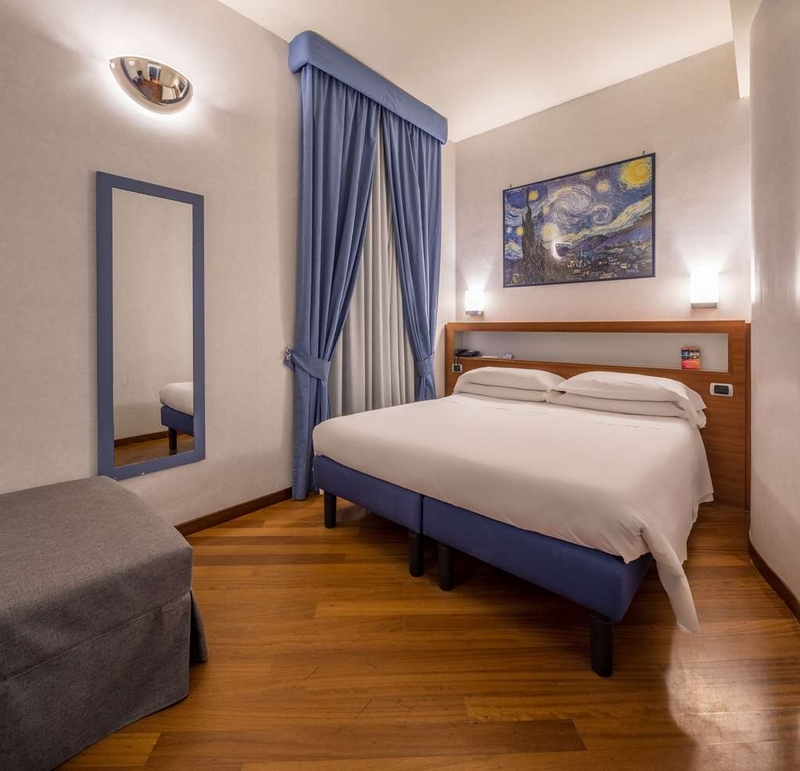 It is within easy walking distance of Centro Storico and the archaeological museum. The rooms are clean and quiet. The breakfast is adequate, with the highlight being that it is served on the rooftop patio and has an amazing view. The area around the hotel takes a bit of getting used to. The piazza in the front is home to a busy pop up market each day. There can be a bit of a mess left some days. There are a lot of people so be aware of pickpockets. "Awesome staff and great service!" Once I got over the shock of the location, I enjoyed my stay very much. This was my first visit to Naples and since I trust Best Western Hotels, I decided to stay here rather than a B&B. When I arrived, I wanted a refund and wanted to go find another hotel but since that was not possible, I stayed. The next day I woke up to find an outdoor market in front of hotel and people were very friendly everywhere we went, the staff in this hotel are awesome, rooms are clean, and they serve a good breakfast. I will definitely return to this hotel in the future now that I feel comfortable and more familiar with Naples which is a unique place surrounded by beautiful places! "No water,water no juice and unfriendly staff"
"Wonderful Little Hotel Near the Train Station." Everyone at the hotel - a the front desk, house keeping, at breakfast - were absolutely wonderful. Very friendly and knowledgable. Our room was small by American standards, but very common as to European standards. And, although small, was absolutely spotless. Breakfast in the morning was better than I had anticipated...very English...scrambled eggs and undercooked bacon...with a fine complement of pastries, cereals and yogurts. The hotel is very convenient to the train station, and is why we stayed here. Somehow I managed to find a seafood restaurant nearby, which had some of the best seafood pasta dishes that I've had during my 3+ years of living in Italy: E Pronto i Mangia. Find it. Eat there. Prices were excellent as well. As a note: Piazza Umberto was quite dirty - and is to be expected near the train station - but we had absolutely no issues at all walking through the neighborhood during they day or evening. Lovely hotel and friendly service. Lovely sun roof garden on the top floor for breakfast. Convenient location for main train station, Metro and historic quarter. Wi-Fi strong signal throughout hotel. Only 20 minutes from Napoli airport by taxi. The hotel has very good rates but it is located near by the train station. The streets on the back of the hotel are not so safe in the night; we were 4 and we never had problem. During the day there is no problem. 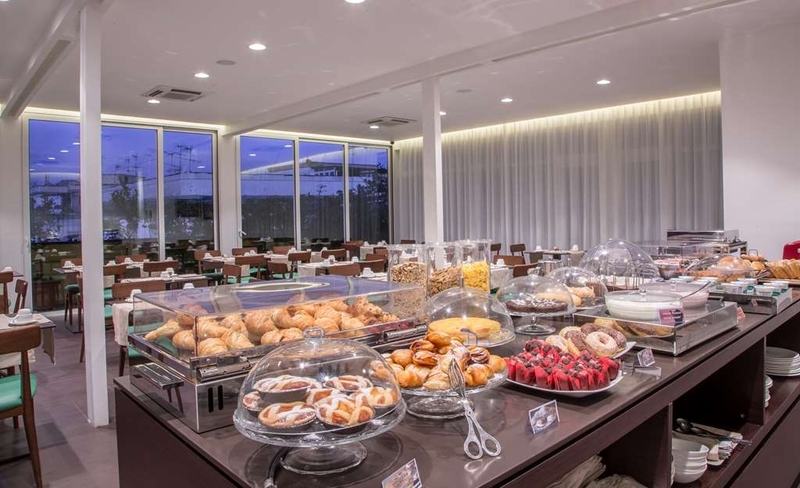 The breakfast buffet is good enough and offer fresh fruit and yogurts and continental breakfast. 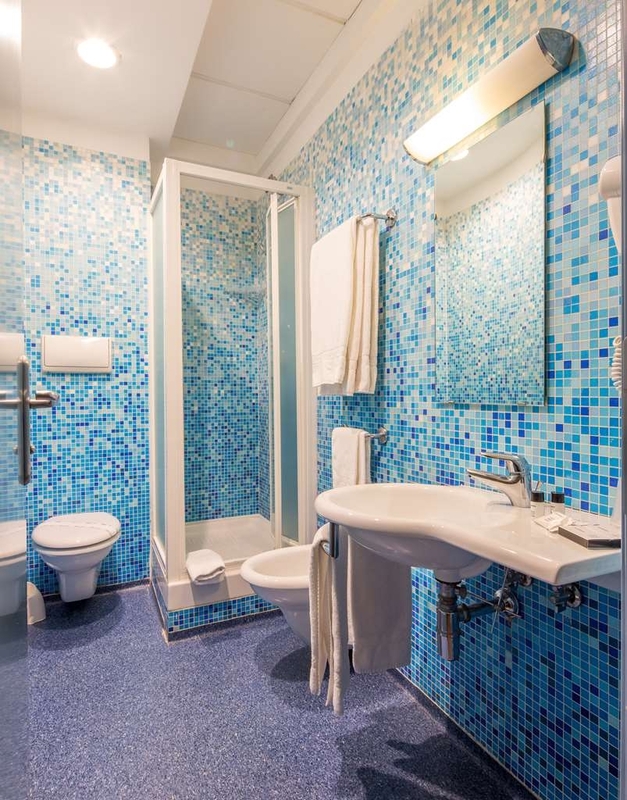 The hotel staff is very friendly and professional and will help you a lot to really enjoy your stay in Naples. Went to have a shower NO hot water then noticed that the shower hadn't been cleaned chunkes of hair and dirty. Call reception they called house cleaning. House cleaning had the ordasadity with attitude that,we had done it.. Also they new there wasn't hot water. FOR YOUR HEALTH AND SANITY STAY AWAY FROM THIS PLACE!!!! "Hotel great - city not"
The hotel was lovely and staff friendly. The walk to the hotel from the train station at night wasn't great. There was litter everywhere and some guy shouted into my girlfriends face & scared her. During the day the city is much nicer but we never felt safe. Can't argue with the hotel though. The room was lovely and breakfast really nice. "400 yards from central station"
We booked this hotel as we were only staying one night in Naples and needed to be near the central station. It was a good price, less than £35 and we have stayed at previous BW hotels, and they tend to offer a comfortable stay. The hotel is approx 400 yards from the station, but the walk to there is an eye opener. There are lots of people of many diverse origins, and we have been to a lot of places and railway stations in the past, but this is the only one, where we have felt unsafe. We were offered ipads for sale by dodgy blokes and there were lots of groups of guys hanging around. We were too early to check in and were able to leave our luggage in a cupboard behind reception. On actual check in later, we were met by Gianfranco, who was very friendly and pleasant. He gave us room 220, and when we got in there, we realised that it was occupied (luckily the resident wasn't in). We immediately returned to reception, and Gianfranco to be fair, was on his way to us, to inform us of the mistake. He apologised profusely but it was still very unsettling. We were allocated 310, which overlooks the square to the front of the hotel. The room was okay, shutters and door to external was ok in terms of soundproofing, but internally, the walls are so thin, you can hear everything. Having listened to the guy next door, on his phone for 3 hours, we eventually went back to reception and Gianfranco, phoned the guy and asked him to quieten down - he had been on an office call!! TV was rubbish. Best entertainment was watching the aged prostitues located outside - at 9am in the morning! Fridge good. Bed comfy and pillows good. The hotel is warm and water in shower was not hot. We didn't go out at night, wouldn't have felt safe to walk but there is a little shop next door, which sells wines etc. We were given free breakfast because it was xmas - okay, glad we didn't pay for it. We were able to store our luggage on the day we left, although, it wasn't in a locked room - which was a little off putting. Reception is 24 hrs, which is needed in that area. Cost was good but really, I am surprised that anyone chooses to stay here - we have been in some difficult locations but this area made us both feel unsafe. Would not return nor recommend. "Never to be visited again!!!!" only good thing about the hotel is its proximity to The Central station, the basis on which we selected this hotel which was big mistake since it was overshadowed by all the other negatives 1. Rooms are very small(terribly small) 2.hotel surroundings are unsafe, very dirty with heaps of garbage 3.huge crowd of unsocial people around the hotel, don't feel safe walking outside 4.reception staff of the hotel were completely insensitive, we were asked to leave our bags open in the reception area, since the cloak room was full, and upon showing our concern about safety of our luggage, we were advised to get it deposited at Napoli central cloak room 5. Breakfast was average though options at the hotel were quite limited and we encountered Long queues. "I have been there on October 7th 2015"
The hotel was clean, but had no balconies the staff were very nice, but in front of the hotel there is a flea market during the day until arount 2:00 pm then the persons that hold the flea market throw all their garbage in the center in front of the hotel and do not pick it up so it does not look good. At night lots of groups hang out in front of the hotel making it a little scary to go out. So if you go there you must stay inside at night. When our cab driver came to get us to go to the airport at 5:00 am there were 3 men that came to the taxi and asked for money it is very scary, so if you want to walk around at night not the place to stay, unfortunately. I didn't make reservations here, a friend did. We were mugged a block away from the hotel, in broad daylight. For several surrounding blocks, there is nothing but crime in the streets, trash, and SO MANY illegal immigrants. My opinion of Naples? I will NEVER come back. The hotel has cameras everywhere. Presumably for guests protection. I had been told this was a high crime area and indeed it is. The rooms in the hotel are tiny, like a cruise ship. It's relatively clean. This IS NOT A SAFE AREA. The shower tray wasn't draining and overflowed onto the en-suite floor on the 1st day so we reported this the very next morning expecting that it would be fixed that day. That evening I had a shower and the water once again filled the shower tray and then overflowed all over the en-suite floor again. I phoned reception who took ages to attend and when he did he just fiddled about with it but couldn't fix it. We asked to be moved to another room but he was most unhelpful and said that there were no empty rooms! During the exchanges between us he even had the temerity to suggest that I was only making a fuss as a result of injuries received in an incident earlier in the day! We persisted and eventually he agreed to move us to another room. He had trouble opening this room with the key but left it with us. After several attempts to open the door we gave up and after some more insisting were eventually moved to a family room on the 4th floor. Why this wasn't offered in the 1st place was not explained. Why the shower waste wasn't fixed during the day is also a mystery. This man was also overheard in a conversation regarding procurement. Such a man should not be employed in a receptionist's job at this hotel. In none of the rooms was the door closer arm connected so the room doors wouldn't automatically close as they should; they were, therefore, potentially unsafe in the event of fire. This was pointed out to reception who noted it down at the same time as the original complaint about the shower. None of the closer arms were re-located in the tracks during our stay. The breakfast room layout was poor with it all jammed up in a corner so everybody was falling over everybody at breakfast time. The door to this room was locked sometime after breakfast so when we returned to have a drink on the roof garden we were unable to get to it as the only access was through the breakfast room. Our family room didn't have a balcony so we couldn't relax with a drink on it as we could with the original room. But maybe that was just as well because the view from that was of a rubbish tip when the market stalls were cleared away for the night. The traders just left all their rubbish where it fell. The grassed area behind was littered with the bottles and rubbish left by the itinerants who spent all day and night just sitting on the wall surrounding, all this just 10m from the main entrance door of the hotel! To keep them company there were up to 4 prostitutes plying their trade on the corner. The staff made no effort to keep the short walkway from this unseemly area clear of litter, nor to replace the tattered flags above the main entrance. The view from the window of our family room was of an enclosed, untidy, yard surrounded on all sides by unkempt buildings. The actual breakfast menu was good - no complaints there. The Wi-Fi worked ok in our room. I just wonder why Best Western are allowing their name to be put to any hotel in this location and then allowing it to be run in such a slipshod way? I only booked this hotel because it was advertised as a Best Western having had poor experiences in another hotel nearby. I assumed - wrongly - that it would be better! "Nice inside but poor location"
This was more of a business hotel and lacked the character and charm of other places we stayed in Italy. Location was good in terms of the main station but out of the way of other tourist sites and if I was to come again I would stay elsewhere. Rooms were nice and clean and there was. Good breakfast in the morning. Exactly what it says on the tin. Simple budget hotel with everything you could ask for. Booked a room on the day we arrived as we had a problem with the hotel we had actually booked to stay it. Five minutes and we had a room. Only slight downside, they slightly inappropriate man at reception who was clearly hitting on my GF. Creeeeeeepy.